It is true, as the late Christopher Lloyd once said, that there shouldn’t be too many vested interests in a garden. Invariably, tastes cross, words are exchanged and dirt is thrown. 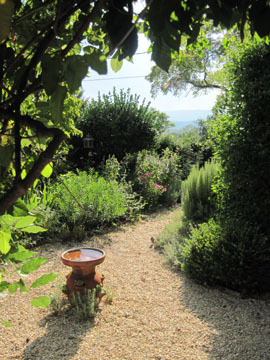 I have rarely seen a couple equally driving the feel and scope of a garden – one gardener always has his or her hands firmly on the steering wheel. Of course this doesn’t stop me having fabulous visions of my husband and I working side by side, smiles on our weary faces as we build a wall together, or dig in a new bed as the sun goes down behind the deck. Alas, such visions will remain pure fantasy. He is far too apt to categorize such nonsense as ‘work’, where I consider the same tasks firmly within the realms of ‘pleasure’. It is far more usual to find me covered in smiles and soil and sweat and up to my hocks shoveling compost, while my husband smiles at the scene in front of him from a comfortable (and cleaner) distance; that is until the piano gives him the ‘come hither’ and he heads inside for hours of Rachmaninoff on steroids. Yet, once every couple of weeks I see him lingering just a little longer on the porch. I recognize the signs of contentment instinctively. He is not complaining about the mosquitoes, having sprayed his extremities in a moment of rare preparation. He has commented on the beauty of the evening and the way the light is playing hide & seek in the front border. Perhaps he has even poured himself a drink. He is ready to take a tour with his resident gardener and waits only for the invitation. I rarely need to be asked. Soon we are walking with slow footsteps down the gravel walk. I am pointing out plants I have just moved, plants soon to bloom, or those for which I have high hopes in the spring. He is nodding patiently and asking just enough in the way of questions to let me know that he is interested and not just on his way to the mailbox. We tread paths that we have tread for years, and I answer the same questions I answered two weeks before, yet there is nothing tired about the exercise – we are merely continuing a tradition we started a million years ago when mortgages and college savings plans seemed a lifetime away. My husband and I didn’t meet whilst exchanging rose cuttings at a plant swap for twenty-something plant geeks. Far from it. He was in the desert, I was in college, letters were exchanged and Saddam Hussein was involved, however indirectly. However, the days of our early marriage were often spent traipsing around various public and private gardens, lying in the sun on great swathes of lawn, and having a sandwich in garden tea-rooms when we were feeling profligate and peckish. Gardens – whether ours, or somebody else’s – have always been a part of our marriage, and though it amuses (and sometimes annoys) me that he is oblivious to the actual daily work involved in creating and maintaining our own, I am tremendously thankful that he does appreciate the result in all its unfolding beauty, and further enjoys a few quiet moments together walking through our little kingdom. These walks are gratifying not least because there simply wasn’t a garden here when we moved in nine years ago. 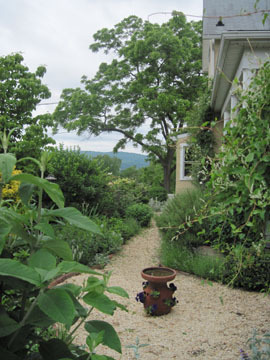 Those of you with larger gardens may be tempted to ask, “How much wandering can one do on a 6000 square foot lot anyway?” But with a little planting ingenuity and a bit of gravel, you’d be surprised how many rooms can be made, how many surprises can lurk, and how much joy can be gained from exploring those nooks and crannies with another human being. Our wandering always ends the same way. He looks wistful for a moment and talks about our next garden; how given more land, more sun, less in the way of Black Walnuts and more in the way of ready cash, he fully expects something along the lines of Kew or Longwood to emerge magically from the soil. I smile equally wistfully and imagine something slightly smaller but just as magical; equipped with hen-house and a large koi pond filled with various forms of lilies – not to mention a greenhouse equipped with a full time undergardener with workaholic tendencies. Perhaps these dreams will be fulfilled, perhaps not. In any case, and with the blessing of more time upon this Earth, we will no doubt be walking together through whatever greenery surrounds us well into our golden years. There might be canes involved, and the evening’s tipple may have evolved into Ensure on the rocks with a twist of lime, but the wander will always be sweetly familiar – no matter the venue. I know what you are saying, only it’s just the opposite at our house. My gardening job it to say how wonderful it all looks as he is showing me new and changing terrain. He is doing a wonderful job and I do appreciate it. 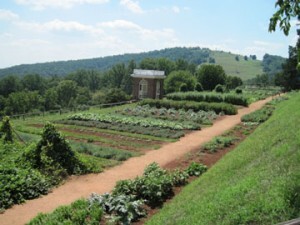 Yes…Monticello’s vegetable gardens. But I wouldn’t take them without about six interns and a massive greenhouse!